Marion County is a county located in the U.S. state of Texas. As of the 2010 census, its population was 10,546. 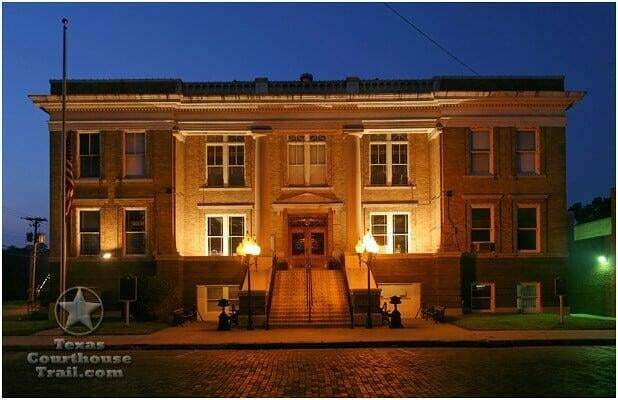 Its county seat is Jefferson. Marion County is in East Texas and is named for Francis Marion, the Revolutionary War general from South Carolina who was nicknamed the "Swamp Fox"
Trooper James Burns was shot and killed following a high speed pursuit in Marion County, Texas, at approximately 8:00 pm. The suspect stopped his vehicle, exited, and opened fire on Trooper Burns with a shotgun before he was even able to unlatch his seatbelt. A citizen used the trooper's radio to inform dispatchers that the trooper had been shot near the intersection of Farm-to-Market roads 1969 and 729. The suspect fled the scene and committed suicide two days later. Trooper Burns had served with the Texas Department of Public Safety for 5 years. He is survived by his wife, 6-month-old daughter, parents, and two brothers. Investigator Dale Sherrill succumbed to injuries sustained in an automobile accident two days earlier while responding to a domestic disturbance. His department vehicle was broadsided as he entered the intersection of U.S. Highway 59 and State Highway 49. He was flown to Good Shepherd Medical Center, in Longview, where he remained until succumbing to his injuries. Investigator Sherrill had served in law enforcement for 10 years. He is survived by his wife and three children. E. R. Todd was the Constable of Precinct 4 in Marion County. He lived in a community variously described as Log Cabin, Smithland and Whatleyville east of Jefferson, the county seat. Clyde Whatley, an oil field worker, agreed to take a married woman to visit one of her sick relatives. Constable E. R. Todd tried to discourage the woman from taking the trip with Whatley. Whatley and the woman knew that her husband was upset by the trip, but they went anyway. Upon their return, Whatley stayed away from the husband. On Saturday, February 10, 1940, Whatley, armed with a gun, went to the neighborhood store and asked the husband to step outside. Whatley contended he had a friendly conversation with the husband. While they were talking, the constable walked up to where they were. Whatley alleged he acted in self defense because Todd drew his pistol first and Whatley believed Todd was going to kill him. The husband's newspaper account reported that Whatley drew his gun and shot Constable Todd through the sleeve. The next shot hit the constable in the back, and as he fell, the constable tried to draw his own gun. After firing two more shots at the constable, Whatley drove away. The court record shows that Constable Todd had his pistol in a loose scabbard under his shirt. After the shooting the pistol, still in the scabbard, was lying near the constable’s hand. Constable Todd knew Whatley and the husband and wife, and the constable knew the husband was upset over Whatley taking his wife on a road trip without his permission. The constable had warned the woman not to go. When the constable saw Whatley and the husband together, he had to have concluded that trouble was brewing. Whatley's own testimony was that he stayed away from the husband because he knew he was angry. Whatley took a pistol with him when he went to confront the husband. Whatley alleged self defense, but the court record reports Todd’s pistol was still in his holster when he was killed. Clyde Whatley was convicted of murder without malice and assessed 5-years in the penitentiary. He appealed over being denied bail and the case was reversed and remanded for a second trial. Whatley agreed to plead guilty and was assessed a 2-year sentence in the penitentiary. E. R. Todd was born on September 25, 1896 and was 43 years old at the time of his death. He was survived by his wife, Gertrude. He did not have any children. He was buried in the Shiloh Cemetery in Cass County. 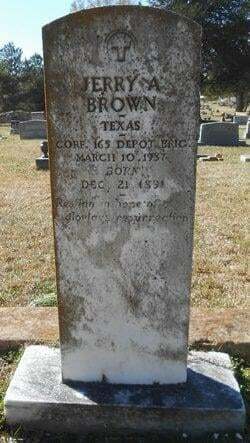 Sheriff Brown was shot and killed in his bedroom as he prepared himself for bed. His apartment was attached to the county jail. A man who escaped from jail five days earlier was arrested following the murder and confessed to killing Sheriff Brown because he believed the sheriff would kill him if he was caught. The suspect was sentenced to death and executed on May 31, 1938. Sheriff Jerry Brown had been with the agency for one year. His wife was appointed to complete his term in office. He was survived by his wife and two children. On Monday, November 27, 1905, Deputy Sheriffs John Sydney Dugan and John W. Wilson went to arrest a man. The suspect shot at the deputies 6 to 7 times. Deputy Wilson accidentally shot Deputy Dugan in the crossfire. The newspaper noted the man was arrested, but his name and any disposition on the case is unknown at this time. The newspaper stated the wound was not necessarily fatal. However, on Wednesday, November 29, 1905, Dugan died from his wounds. As was the custom of the time, Deputy Wilson was charged with murder and posted bond. John Sydney Dugan had been 48 years of age just 9 days when he died. He was survived by his wife, Alice Thacker Dugan, and seven children. Three children had died as infants. He was buried next to his mother, Mary Ann Dugan, and three infant children in the Kellyville Cemetery in Marion County. Deputy Sheriff John W. Wilson was still on bond for the death of Dugan when on Saturday, March 24, 1906, Wilson was shot and beaten to death in his home near the Comet community in Marion County. Wilson and his family were tenants on the farm of John Coffman. One of Coffman’s sons married one of Wilson’s daughters. The boy left his wife and bad blood existed between the families. John Coffman and his son, Ben, were convicted of the murder. John Coffman received 20 years in prison and Ben Coffman received 40 years in prison. A.L. (Ab) Allen had a record of arrests for drunkenness, gambling, horse racing and fighting. On April 15, 1884, Allen was armed with a pistol and drinking when an argument ensued, and Allen shot and killed Robert Pastian. Allen was convicted and sentenced to the state penitentiary for 60 years. About 1900 Allen was pardoned and returned to Marion County. Allen was again arrested for being drunk and fighting. On one occasion he was armed and threatened the sheriff and a deputy who tried to arrest him. On another occasion, he allegedly disarmed Deputy Sheriff Will Griffith and struck him on the head with a pistol. Bystanders intervened to prevent further violence. On July 6, 1904, Ab Allen and Deputy Will Griffith met in front of the Star Saloon on Austin Street in Jefferson. A few words passed between them when Allen shot Deputy Griffith with a shot gun, which he had borrowed for the purpose of shooting his son, Ernest Allen, or Deputy Griffith. He allegedly met Deputy Griffith first, so the shooting commenced. Deputy Griffith pulled his pistol and fired several shots, striking Allen in the groin. Allen went into the saloon and fell to the floor and died minutes later. Deputy Griffith was shot in the bowels, and was taken to Dr. Armstrong’s office where he died at 7:30 p.m.
William “Will” Griffith was buried in Section L of the Oakwood Cemetery, Jefferson, Marion County. No marker located. He was survived by his wife and at least one son. Deputy Charles J. Schwab was shot and killed while attempting to deal with a mentally ill man. The suspect was confined to a mental hospital. Deputy Schwab had been with the agency for 20 years. Marshal William Sanford was shot and killed at 1400 hours when he was ambushed while eating in a local restaurant. A suspect approached the man and shot him without saying a word. The suspect was apprehended by the military.